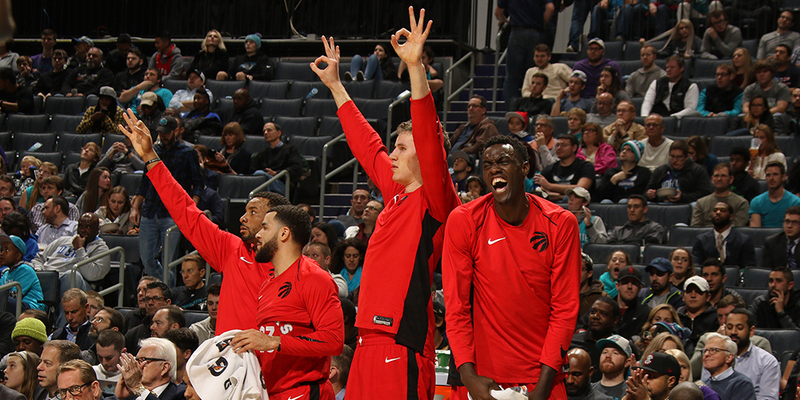 The Raptors bench mob has been a large part of what has propelled them to the level of play they've been seeking for years. What exactly is it that has made this unit work so well? Contributor Ryan Nguyen explores. This article is a collaboration between Ben and Ryan Nguyen. Ryan is a performance analyst for the Canadian Development Women’s National Team, a video coordinator for the Cape Breton Women’s team, and has been cutting up and identifying keys sets on YouTube and Twitter for a few years now. If you’re interested in Xs and Os you should definitely check out his videos and Twitter feed. That’s the constant refrain we’ve heard from Toronto over the last few seasons. This year we’ve learned from our past mistakes. This year we have enough playoff experience. This year we have the depth. And yet so far, each year the same thing has happened: playoff disappointments leading to offseason questioning leading to roster or coaching tweaks leading to hope — leading once again to letdowns. This last summer, Toronto faced a real turning point. A host of free agents, Kyle Lowry the most prominent among them, would have allowed them to turn over the team and change course. They could have traded DeMar DeRozan and unleashed a youth movement. They could have fired Dwane Casey. Instead, Toronto president Masai Ujiri decided on one last attempt to alter the results without swapping out the core pieces.